IPVanish Review 2018 – Is IPVanish Secure and Private? Mandee Rose | Posted on February 26, 2018 March 27, 2019 | 2 Comments on IPVanish Review 2018 – Is IPVanish Secure and Private? Headquartered in Orlando, Florida, IPVanish is a well-established virtual private network (VPN) provider with more than 700 servers located in 60 countries across the globe. The primary characteristic of this privacy service is the speed that customers get out of its network. The company offers a seven-day money-back guarantee, so you won’t lose money if you just jump in and sign up to try it out for a few days. Enjoy our straight-talking review to find out all about this speedy VPN service. Lightning-fast servers and a wholly-owned network puts this successful service in everyone’s top five. IPVanish is constantly evolving. That’s why you need to check the latest reviews before you choose your VPN service. The company keeps an eye on consumer opinion and has adjusted its service accordingly. The security offered by the service is about as good as that available with any other VPN on the planet. However, VPNs differentiate themselves through secondary considerations. In the case of IPVanish, they went all out to win the crown of the fastest VPN service in the world. You may read reviews that consider this to be one of the most expensive VPN services around. Well, that may have been the case once upon a time, but now, when listed among the top five or ten VPN services in the world, its annual price puts it slap bang in the middle of the chart. Naturally, you get a lower price per month for a longer subscription period. You have to pay upfront, so you can’t get onto the network without paying anything. However, if you don’t like the service, and cancel your subscription within seven days of signing up, you get all of your money back. The charge will set up as a repeat payment in your payment account, so if you don’t want to be recharged automatically at the expiration point of your subscription, be sure to cancel the service before your pre-paid period runs out. Alongside the regular credit card and debit card payment methods, you have every web shopper’s favorite, PayPal. The ability to accept bitcoin gives you another layer of anonymity. The digital currency is stateless and so no government can order it to hand over the details of your account. One note of caution for those who pay with bitcoin, though – the payment type is a foreign currency, which means that it may not have the same value every day. If you choose to cancel your subscription and bitcoin’s value has gone up against the dollar during that period, you won’t get the same amount back into your account. This is because IPVanish requests the dollar equivalent of bitcoin on the day you subscribe and sends back the same dollar amount on the day you cancel. What Do I Get With IPVanish? Unless you’re in the habit of reading tech reviews, right now you’re probably thinking, “What does all that mean?” Don’t worry. The following sections wade through the jargon to help you better understand how VPNs work. You will find out how IPVanish compares to the rest. When IPVanish talks about its user-friendly apps, it is referring to its custom-built interface, which you download onto your device once you subscribe. This is the program that gives you controls for the VPN. IPVanish has written versions that work on Windows computers, Linux machines, and Macs, smartphones running Windows, Android, or iOS, Chromebooks, and directly on routers. Further down the list of features, you will see that the service gives you access to censored apps and websites. This refers to the ability of network managers, internet service providers (ISPs) and governments to block communication with certain IP addresses and websites. When you access the internet through a VPN, your computer sends a message to the VPN company’s IP address, and so the blocking software doesn’t spot that you are accessing a banned website – the VPN accesses that site on your behalf. Many TV websites block access from those with IP addresses outside the countries in which they operate. When you select an IPVanish server in that country, this tricks the site into thinking it is dealing with a local request and so it allows access – the VPN passes that content back to you instantaneously. The location of IPVanish’s headquarters could be a problem. Lawyers acting on behalf of copyright owners have, in the past, forced web companies dealing with torrents to hand over access logs. You will see from the list of benefits offered by IPVanish that they offer anonymous torrenting, and allow unlimited P2P transfers. Together with the service’s high speeds, these attributes make the IPVanish VPN particularly attractive to those who want to download movies and music with torrents. It is the downloading of copyrighted material that particularly attracts legal action in the US. It is very difficult for US lawyers to prosecute VPN services based in far away countries where everyone speaks a foreign language. It is very easy for them to go after a US-based service. However, IPVanish does not keep activity logs. They cannot hand over information that they do not have, and so your identity is protected. Your first task is to decide which subscription period you want. Then you need to have a valid email address and the details of your payment account. After getting through the payment section, you are able to access the download screen. The company has several different versions, each of which suits a different operating system. After you click on the emblem that represents your operating system, the client software will download. After a few simple instruction screens, the software will install itself. The Windows version of the interface has an easy-to-use menu bar down the left panel of the window. Clicking on the tabs at the top of the main panel brings in other options. Those who are not tech-savvy probably should avoid the Settings tab. Here is a view of the main screen during a connection. You see that the main feature of the app is a map, showing your location. The Settings tab is a little more involved. The Android version of the app manages to retain all of the functionality of the desktop screen, despite the restrictions of space. 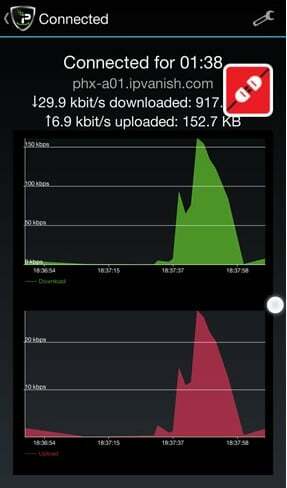 Here is a view of the throughput monitor as displayed on an Android device. Customer support at IPVanish is implemented through an FAQs page and a user forum, and more directly through emails to the support team. There is no live chat. The initial call to the support team is made through the company’s website. The exceptional feature of IPVanish is that they have complete “vertical integration,” which means that they own their own chunk of the internet. The company runs a Tier-1 network – they do not outsource their internet access to anyone else, so the traffic they send out does not have to share cable space with the data transfers of other companies. This is unique among VPN providers and means that, unless one of the rivals adopts the same policy, you are never going to get faster throughput with anyone else. IPVanish owns and operates more than 700 servers, located in over 60 countries. Again, this is an unusual dedication to a business model that prioritizes accountability. You would expect IT-focused companies to outsource a lot of their infrastructure, buying in services from a large number of different pre-existing providers. Not IPVanish. Their network was purposefully designed and built from the ground up. 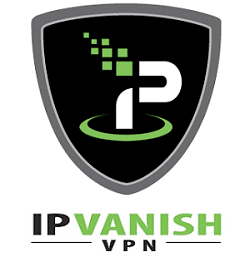 Given that IPVanish put so much time, effort, money, and expertise into creating a dedicated VPN network, you would expect their service to be almost unnoticeable. It is. Despite the fact that computers are very fast these days, using a VPN creates extra routing and extra work to repackage, encrypt, decrypt, unbundle and forward data packets. However, gamers and those who use video streaming should not notice any deterioration in service quality when they add this VPN service to their internet communications. Should I Subscribe to IPVanish? Prospective users should have no hesitation in subscribing to IPVanish. The company’s high-spec infrastructure is second to none. Gamers and those who stream video would benefit from being able to access their home services, as well as when they are abroad and would otherwise be locked out by geo-restrictions. Those who like to download copyrighted entertainment for free should be assured by the company’s no logs policy. Nice review. Thanks. Is IPVanish compatible with Windows 10? Is so, how does setup differ from what appears in the review? Also, am I correct in assuming that IPVanish could be available a laptop, a table, an Android phone, and a desktop machine on a single account but that only two of these at could be have IPVanish activated cotemporaneously? Hello Carl, IPVanish setup on Windows 7 is quite similar to Windows 10 but there are few difference. We will definitely update the IPVanish Setup for Windows 10 soon, which might solve your issue. IPVanish is compatible with your laptop, desktop, handheld devices and gaming consoles; and also you can install the app on any of the mentioned devices but can only log on to your SINGLE account with two devices simultaneously.